Notes: "Cairn on the summit of Corndon Tor, to the north of the main outcrop, comprising a large stony mound, constructed from moorstone with a truncated cone profile and no turf cover. Remains of a possible second cairn are located to the south on the outcrop." Notes: Turner E51. Dixon #69. Bar Rep 56. Butler Money Pit - Vol. 1. Map 14.11 (photo on p.92, diagram pp.125-6). Grinsell WIDECOMBE 21. 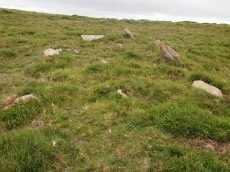 "The south cairn is a very spread and slight earthwork with a centrally placed cist. 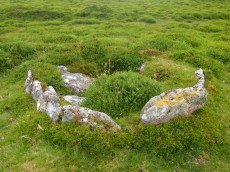 Only the north and west side slabs of the cist remain in situ though a misplaced slab lies to one side of the chamber. Eleven slabs forming a kerb of approximately 3m surrounding the cist remain in situ. Several additional stones survive, protruding just above the surface of the flattened cairn, which are likely to be evidence of an outer circle with a diameter of approximately 11m". Lethbridge diagram p.122 and photo bottom p.122.